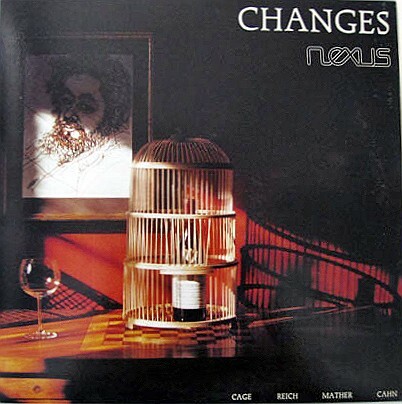 “Changes” is a NEXUS recording that was done in the early days of NEXUS, 1982, and is now out of print. It features works by Bruce Mather, Steve Reich, John Cage, and Bill Cahn. 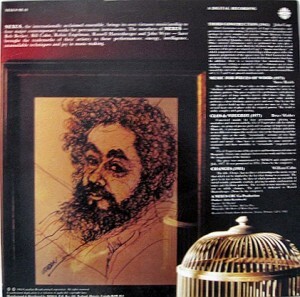 In the photograph of the front cover of the LP album (left) you can see Michael’s self-portrait (drawn in ink). I believe NEXUS member emeritus Robin Engelman still owns the portrait. The Changes cover was set up and taken in Robin’s living room when he lived in King City, north of Toronto. The NEXUS members set it up to include Michael’s portrait (as he had recently died), a bottle of Clos de Vougeot (1964 – a truly great year!) because it is the title of Bruce Mather’s piece on the album, and the bird cage (as Bob Becker says, “A weird reference to John Cage, whose Third Construction is on the album, and to Reich’s Music for Pieces of Wood – the bird cage is made of wooden sticks.”) Here is a photograph of the back of the album, with a clearer view of Michael’s evocative self-portrait: The album’s title Changes refers to Michael’s passing of course, but is also the title of Bill Cahn’s piece included on the recording.